DARPA, the advanced concepts research group voted most likely to destroy the Earth, has come up with a bizarre futuristic idea for the Pentagon. They want to create an army of cyber-insects that can be remotely controlled to check out explosives and send transmissions. The organisms would truly be cybernetic; the idea is to insert microelectromechanical systems (MEMS) at the pupa stage, when the insects can integrate them into their body, so they can be remotely controlled later. A number of experts are skeptical, but it sounds fairly plausible to me. Most criticisms of the plan have to do with the supposed implausibility of creating such small MEMS. Indeed, today it is quite impossible, but the miniaturization revolution is in full swing, and it's likely that MEMS will eventually be manufactured that are small enough to fit inside the insect at the pupa stage. Moreover, scientists have already created cyborg roaches that have had their nervous systems tapped into. A research team at Tokyo University is making 'cyber-roaches' by lopping off the antennae of regular cockroaches and replacing them with pulse-emitting electrodes. 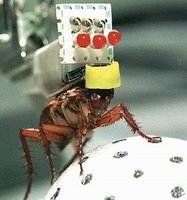 The researchers then send signals with a remote control to a backpack worn by the roach that powers the electrodes. The roaches can be told to go left, right, forward and back. This is starting to become something of a trend. It was rumored at one time that either China or the United States was developing nano-ants for the purpose of destroying the enemy's infrastructure. While somewhat outlandish, it does bring to mind the evil potential for robotic locusts and other man-made blights. Indeed, these are dangerous precursors to nanoweaponry and other forms of advanced bioweapons. Süddeutsche Zeitung Online recently featured an article about the potential for nanotech-equipped soldiers -- namely smart dust, self-healing body armor and self-reproducing nanobots. Some analysts, including Jürgen Altmann, are starting to think that arms control needs to be extended to miniature weaponry. In his book, Military Nanotechnology: Potential Applications and Preventive Arms Control, Altmann takes a look at the prospect of future weapons and considers international security, the new dangers for arms control and the international law of warfare, the dangers for stability through potential new arms races and proliferation, and of course, the dangers to humans and human civilization altogether. The specific technologies that Altmann considers include extremely small computers, robots, missiles, satellites, launchers and sensors, lighter and more agile vehicles and weapons, implants in soldiers’ bodies, metal-free firearms, autonomous fighting systems, and new types of chemical and biological weapons. Thinking it through, Altmann concludes that international treaties need to be installed, existing non-proliferation agreements need to be extended, and that a general ban on autonomous robots smaller than 20 centimeters needs to be put into force. But as the actions of the United States has recently shown, it is a country that is not very interested in these types of constraints. Back in 2000 George W. Bush pulled out of the Biological Weapons Convention, and in 2003 he withdrew the US from the 1972 Anti-Ballistic Missile treaty with Russia. And as the illegal (civil)war in Iraq continues, and as DARPA looks to litter the battlefield with cyber-insects, the chances of attaining global consensus on the regulation of miniaturized weapons looks slim indeed. Tags: cybernetics, advanced weapons, darpa, nanoweapons, arms control, foresight, disaster prevention, future warfare. Seeing technology abused for warfare is depressing. I think that maybe the only way to promote the self-preservation of Mind on Earth is to do away with the human antecedents of AI.